Because they now have a deal to give huge tax breaks to the already wealthy while screwing public education, while screwing the unemployed and the poor, while screwing the environment, while screwing women (and not in a good way). One last major screwing left to do ... voting rights. McCrory's body-language in this photo from yesterday speaks volumes about how totally irrelevant he is, how secondary, how subordinate, how puny and ignorable. He's reduced to lying outrageously to claim some active participation in state government for himself ("I mingle with the protesters ALL the time!"). 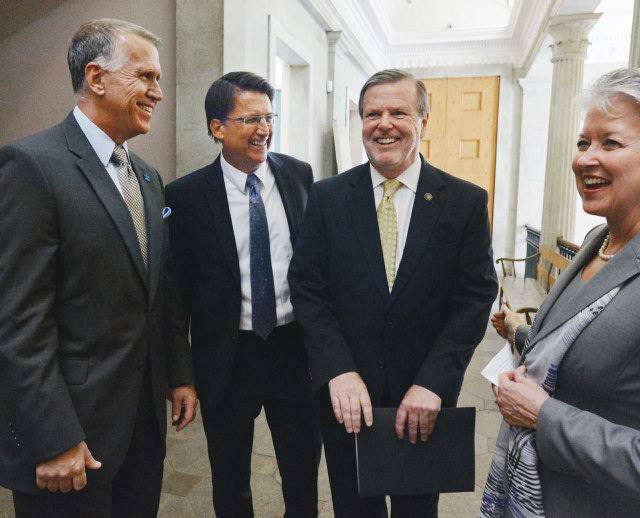 He and Tillis and Berger might want to take a look at the most recent polling in the state. Ain't pretty.